It’s good to have a knife with you when you’re climbing. I use a knife for making V-Threads, cutting away old rap tat, cutting slings, and various other tasks. However, for those times when I don’t have a chalk bag with me (for example, any time I’m ice climbing) I like to have a knife clipped to my harness. Pretty much any small knife will work if you’re keeping it in a pocket. 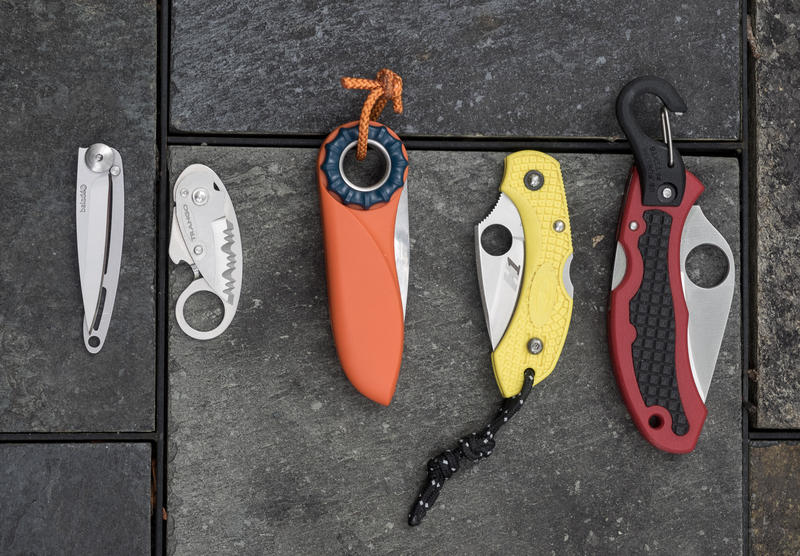 This review will focus mainly on small knives that I attach to my climbing harness. Using old-school round bar stock carabiners will help solve the knife’s propensity to open while on your harness, but it doesn’t solve the “floppy blade” issue. I had this knife open up on me while attached to my harness. Having an open knife blade attached to your harness is not safe. The weak rivet and floppy blade make this knife pretty much unusable. Overall, I was very disappointed with this knife. The Spyderco Dragonfly is a small, high quality knife. This particular model that I use is the “Salt Water” version made with particularly rust-resistant H-1 Steel. It came with a small pocket clip that I removed, and I tied a short lanyard to the knife to facilitate clipping it to a carabiner. The blade is sharp and the serrations make it easier to cut through rope or webbing. The knife can be opened one handed, and once open it locks securely until you release the blade. Overall, I like this knife. It’s a high-quality, dependable tool, and makes a good climbing knife. I bought this knife because it has a built in integral carabiner clip. It seemed like a great climbing knife because it didn’t require a separate accessory biner to attach to my harness. Like the Spyderco Dragonfly, it’s a quality tool with a sharp, serated blade. However, the gear loops on my climbing harnesses are too thick to work with the knife’s integral carabiner clip. The harness loops are so thick that the carabiner clip won’t close. You can sometimes force it and wiggle it and get it on the gear loop, but then it’s really hard to get off. This pretty much defeats the whole purpose of having a convenient, readily accessible knife clipped to your harness. It’s really too bad that this knife’s carabiner clip isn’t a tiny bit bigger. With a bit more clearance, this could have been a great climbing knife. As it is, I don’t use it for climbing. This has become my go-to climbing knife. It has a simple design, with a partially serrated stainless steel blade. The blade rotates into the open position by turning the blue ring. The large hole in the handle is designed to accept a carabiner, so you can clip the Spatha directly into a biner. However, I’ve found that D-shaped biners don’t allow the knife to move freely on the biner and so I tied a short loop of cord through the knife that I clip the biner to. This allows greater freedom of motion and prevents the knife from binding up on the biner. The Spatha has become my favorite climbing knife primarily because of its robust design. When closed, the blade is mostly covered by the protective handle, and I like the fact that when clipped to my harness, the blade tip is pointing down, so there is almost no chance of the tip ever catching on anything and opening accidentally. It’s easy to open and close the Spatha with a gloved (or even mittened) hand. While the Spyderco Dragonfly2 is also a great climbing knife, the simplicity and robust build of the Spatha give it a slight edge in my opinion. I tried the new redesigned version of the Petzl Spatha, and although it’s supposedly “new and improved” I find that I prefer the old First Generation Spatha. The new knife has a locking blade mechanism, and is a hair lighter, but it doesn’t feel as as simple or robust as the Gen I version. There’s more play in the mechanism, more of the blade is exposed when closed, and it feels just a bit more flimsy in use than the Gen I. This knife is NOT something that I keep on my harness. I carry this knife in the pocket of my Tufa Houdini chalk bag, so I have it with me whenever I’m rock climbing. (Review of the Tufa Houdini Chalk Bag is HERE.) The Baladeo is a very light knife. (The 15G stands for 15 grams.) In spite of its small size, it is a well made knife with a sharp blade, and an innovative design that integrates the knife handle into a locking mechanism. 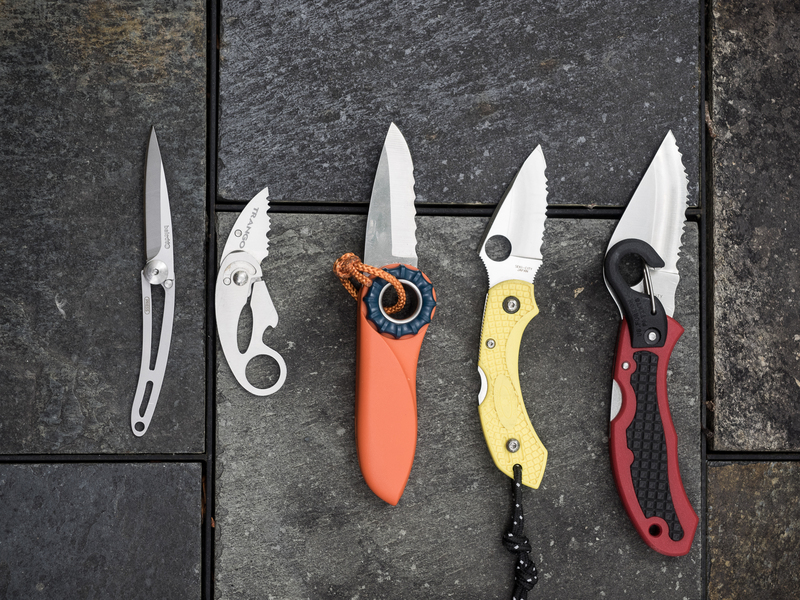 This knife is not suitable for carrying clipped to your harness, but if you’re looking for a small, light pocket knife for climbing, it’s a great choice. Note that Baladeo knives are now manufactured and marketed under the “Deejo” Trade name. This entry was posted in Backcountry Gear Reviews, Climbing Gear Reviews, Knives and tagged Baladeo 15g, climber knife, climbing knife, mediocre mountaineering, petzl spatha, spyderco dragonfly, spyderco snap-it, trango piranha by Kai. Bookmark the permalink.